A New Mac Tip Every Day: Preferred Networks! There was a previous tip that showed how to remove a network from your list of preferred network so your Mac doesn't automatically log in to this network in the future. The main reason why I used this was because way too often, my Mac wouldn't connect to the network I wanted. There is a better way of handling this for situations where your Mac finds many of your preferred networks. You can basically drag the networks around on your list so that the networks that you use the most are at the top of the list. That is the way your Mac chooses on which network to log in. It depends in which order they are. 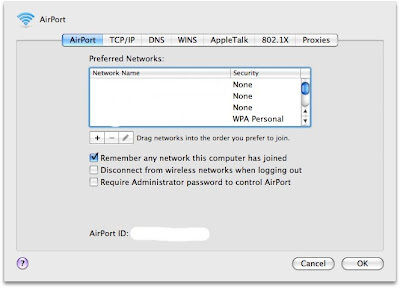 You can access your preferred networks list in the Advanced Airport preferences. I don't need to do this so maybe I'm missing something but why not just change Locations manually, taking the Location off automatic? Choose your network as you have set them up with Locations? dude i see that u're an advanced mac user. i am keen to know on how to publish iWeb pages on a site. and do i have to purchase a site first before i can do that? or is it plausible to publish to blogspot as i want to manage a blog using iWeb. feel free to reply to my email uy.workisplay@hotmail.com. Merci beaucoup ! Wake, Sleep, Shut down schedule! Size of JPG from Photoshop or Pixelmator! Searching within zip files with Spotlight!